The historic First Addition Neighborhood (FAN) of Lake Oswego suffers from chronic localized flooding, deteriorating roadways and minimal pedestrian amenities. The 2009 First Addition Neighborhood Drainage Report identified several projects throughout the neighborhood necessary to address inadequate stormwater infrastructure, help alleviate areas of localized flooding and to provide direction to the City towards meeting regulatory water quality requirements. The rehabilitation of D Avenue is an identified next step which builds upon other recent street rehabilitation projects, including A Avenue and B Avenue. 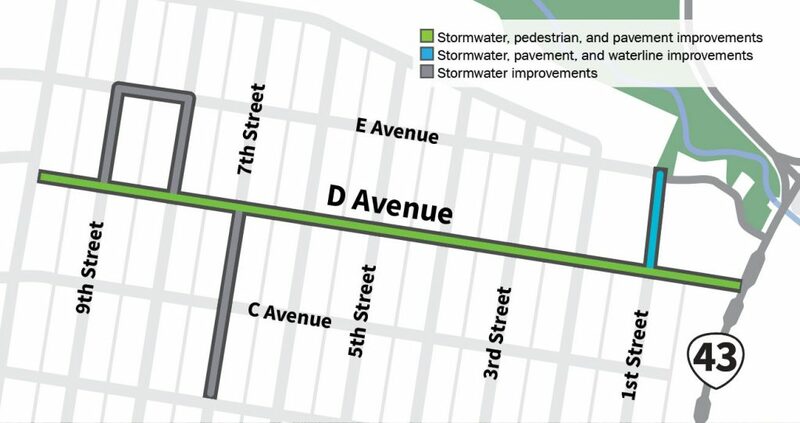 The D Avenue Improvement Project will address stormwater drainage issues, pedestrian access and safety, and poor pavement conditions on D Avenue from State Street to 10th Street. The project will reconstruct the entire ten blocks of D Avenue from State Street to 10th Street, all within the existing public right-of-way. Additional improvements include stormwater, waterline and pavement work on 1st Street between D/E Avenues. A new stormwater pipe will be installed on 7th Street between B/D Avenues. The area bounded by 8th/9th Streets and D/E Avenues will also receive stormwater improvements, including a new pipe and planters/rain gardens. Two neighbor walking tours, two public open houses, numerous face-to-face meetings and extensive field work helped inform the designs of the project. The project includes full reconstruction of the road, new sidewalk, and new stormwater management above ground and below. Portions of the road alignment will meander with slight curves. The majority of neighbors along D Avenue and many others who attended the open houses preferred this approach to accommodate the improvements. The newly built road will still have two travel lanes and be about 20’ wide, similar to the width of the road today. 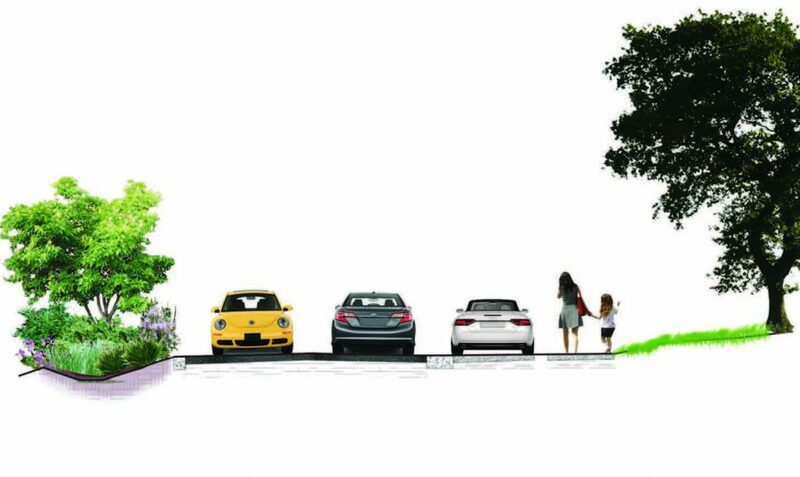 Some areas in the right-of-way will have 7’ wide delineated gravel parking. New sidewalk will be added along the north side of D Avenue, west of 5th The existing sidewalk will be rebuilt on the south side of D, east of 5th Street. Low-level pedestrian lighting will illuminate the sidewalk. About 40 new rain gardens (just over 23,000 square feet) will be located at key locations along D Avenue, and 5,500 feet of upgraded stormwater pipes will help manage street runoff. Additional sample renderings and a map of the final designs are available to view on the materials page. The project will benefit Tryon Creek and improve areas in the neighborhood that experience flooding or drainage issues. The project also includes pedestrian improvements to provide walking connections within the neighborhood, providing safe, American Disabilities Act (ADA) compliant pedestrian passage for school children, residents visiting the library and those choosing to visit downtown businesses. Learn more about what is happening now by visiting our project updates page.